Starting today at NASA’s Columbia Scientific Balloon Facility in Fort Sumner, New Mexico, space scientists from the University of New Hampshire will attempt to launch a football-field-sized balloon carrying a one-ton instrument payload that will measure gamma rays from the Crab Pulsar – the remains of a 1054 A.D. supernova explosion 6,500 light years from Earth. The measurements, taken 130,000 feet above Earth, could eventually provide a window into the universal, poorly understood process of particle acceleration. The Gamma Ray Polarimeter Experiment (GRAPE), which was designed and built at the Space Science Center (SSC) within the UNH Institute for the Study of Earth, Oceans, and Space, is an effort to apply a new type of detector technology to the study of celestial gamma rays. The launch is highly dependent on weather and upper atmospheric wind conditions. The launch window closes at the end of this month. The specific goal of the GRAPE mission is to study the polarization of gamma rays from celestial sources. “Polarized” radiation vibrates in a preferred direction, and the extent of that polarization can provide clues to how the radiation was generated, in essence serving as a probe of the source. In a report published today, new research suggests the enigmatic “ribbon” of energetic particles discovered at the edge of our solar system by NASA’s Interstellar Boundary Explorer (IBEX) may be only a small sign of the vast influence of the galactic magnetic field. IBEX researchers have sought answers about the ribbon since its discovery in 2009. Comprising primarily space physicists, the IBEX team realized that the galactic magnetic field wrapped around our heliosphere — the giant “bubble” that envelops and protects our solar system — appears to determine the orientation of the ribbon and the placement of energetic particles measured in it. An unlikely teaming of IBEX researchers with ultra-high-energy cosmic ray physicists, however, has produced complementary insights that dovetail with IBEX’s studies to produce a more complete picture of the interactions at the solar system boundary and how they reach much farther out into the space between the stars. Space scientists from the University of New Hampshire (UNH) and the Southwest Research Institute (SwRI) report that data gathered by NASA’s Lunar Reconnaissance Orbiter (LRO) show lighter materials like plastics provide effective shielding against the radiation hazards faced by astronauts during extended space travel. The finding could help reduce health risks to humans on future missions into deep space. Aluminum has always been the primary material in spacecraft construction, but it provides relatively little protection against high-energy cosmic rays and can add so much mass to spacecraft that they become cost-prohibitive to launch. The international team running the Alpha Magnetic Spectrometer (AMS1) today announced the first results in its search for dark matter. The results, presented by AMS spokesperson Professor Samuel Ting in a seminar at CERN2, are to be published in the journal Physical Review Letters. They report the observation of an excess of positrons in the cosmic ray flux. The AMS results are based on some 25 billion recorded events, including 400,000 positrons with energies between 0.5 GeV and 350 GeV, recorded over a year and a half. This represents the largest collection of antimatter particles recorded in space. The positron fraction increases from 10 GeV to 250 GeV, with the data showing the slope of the increase reducing by an order of magnitude over the range 20-250 GeV. The data also show no significant variation over time, or any preferred incoming direction. These results are consistent with the positrons originating from the annihilation of dark matter particles in space, but not yet sufficiently conclusive to rule out other explanations. Thirty-five years after its launch, Voyager 1 appears to have travelled beyond the influence of the Sun and exited the heliosphere, according to a new study appearing online today (March 20). The National Aeronautics and Space Administration has awarded $4.4 million to a collaboration of scientists at five United States universities and NASA’s Marshall Space Flight Center to help build a telescope for deployment on the International Space Station in 2017. The U.S. collaboration is part of a 13-nation effort to build the 2.5-meter ultraviolet telescope, called the Extreme Universe Space Observatory. UChicago Prof. Angela Olinto leads the U.S. collaboration. The telescope will search for the mysterious source of the most energetic particles in the universe, called ultra high-energy cosmic rays, from the ISS’s Japanese Experiment Module. The source of these cosmic rays has remained one of the great mysteries of science since physicist John Linsley discovered them more than 50 years ago. These cosmic rays consist of protons and other subatomic scraps of matter that fly through the universe at almost light speed. The science goal is to discover the sources of ultra high-energy cosmic rays by observing their traces in the atmosphere looking 248 miles from the ISS down to the surface,” said Olinto, professor in astronomy & astrophysics at the University of Chicago’s Kavli Institute for Cosmological Physics. A team of astronomers led by Sladjana Nikolić from the Max Planck Institute for Astronomy has observed the supernova remnant SN 1006, probing in unprecedented detail the region where the gas ejected during the supernova meets the surrounding interstellar matter. 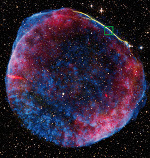 Such remnants have long been thought to be the source of cosmic ray particles hitting Earth. The observations show, for the first time, the presence of “seed particles”, possible precursors of such cosmic rays. The novel approach used by the astronomers promises further insights as to how supernovae remnants act as cosmic particle accelerators. The results will be published on February 14, 2013 in the journal Science. When Victor Hess first discovered cosmic ray particles hitting Earth almost exactly a hundred years ago, he had little notion about their origin. Since then, ever more sensitive observations of these particles have turned up a number of sources. Among them are supernova remnants – cosmic blast waves launched by stellar explosions; expanding gas shells flung into space when certain stars end their lives in a supernova. Where such a blast wave meets the surrounding interstellar medium, there is an abrupt change in density and temperature: a shock front similar to the sonic boom produced by an aircraft going supersonic. This expanding, high-velocity shock front is a natural candidate for a cosmic particle accelerator. Now, for the first time, astronomers have found observational evidence of accelerated protons in these shock regions. While these are not the sought-for high-energy cosmic rays themselves, they could be the necessary “seed particles”, which the go on to interact with the shock to reach the extremely high energies required and fly off into space as cosmic ray particles.